The QualTrace III module in PeakTrace 6 can generate text based Trace Report files on each trace file basecalled by PeakTrace. These files can be supplied to final customers to help them understand why their trace is not to the quality level they might wish and also what they might do to correct the problems. The Trace Report files can be generated with increasing levels of report detail, depending on the user needs. The report files are named after the trace file with “_report.txt” added (e.g. if the trace file name is “trace_abc.ab1” then the trace report file will be named “trace_abc_report.txt”) and saved to the same folder as the output trace file. The Trace Reports can be generated with increasing levels of detail as desired. Trace Reports are only available with the PeakTrace:Box version of the PeakTrace Basecaller and are not available with the Auto PeakTrace RP system. The details of what each output means are described in the QualTrace III User manual. Auto PeakTrace 6.50 introduced QualTrace III only trace reports, allowing them to function independently of PeakTrace. When qualtrace is selected as the basecaller, all references to PeakTrace (e.g. PeakTrace class, PT Good Bases, and Improvement) are omitted from the trace report. In addition, the PeakTrace settings section will not be included in the full report. One of the new features of PeakTrace 6.20 is user adjustment of the PCR trim base. In previous releases of PeakTrace the PCR trim base was set automatically using the skip short base setting value. Since skip short base could not be set to higher than 500, it meant that the PeakTrace basecalling of large PCR products (i.e. those larger than 500 bases) could result in traces with additional bases after the PCR product if there was low level template contamination and/or signal bleed through from an adjacent capillary present. This effect is shown below. Figure 1 shows a KB basecalled trace of a ~530 base-pair PCR fragment. The KB Basecaller™ ends the basecalling at 3 A bases corresponding to the end of the PCR fragment sequence. Figure 2 shows the same trace as in Figure 1, but basecalled using PeakTrace and the default skip short/PCR trim base of 500. Due to low-level template contamination the sequencing continues past the last 3 A bases of the PCR fragment. This extra trace signal is real, but is not wanted by the end user. Figure 3 shows the same trace as in Figures 1 & 2, but basecalled using PeakTrace and a skip short/PCR trim base of 700. The trace is now trimmed to the last 3 A bases of the PCR fragment (as in Figure 1), thus removing the contamination sequence. Setting the skip short/PCR trim base to any value greater than 500 will turn off the skip short traces option, resulting in more traces being basecalled by PeakTrace (this may or may not be a desirable outcome). Setting the skip short/PCR trim base to a high value (i.e over 850) may result in weak signal traces being falsely detected as PCR product traces resulting in premature trimming. For these two reasons it is recommended that the skip short/PCR trim base only be adjusted when sequencing large PCR fragments larger than 500 bases. One of the most simple of the new features within PeakTrace 6 is the trim 3’ end only setting. This option allows you to use trace trimming to remove the low quality bases from the 3’-end of the trace while keeping the low quality bases at the 5’-start. Figure 1 shows an example KB™ basecalled trace file. The first 40 bases have a very low average quality score. Figure 1. First 60 base of a KB basecalled trace. Figures 2 & 3 show the same trace basecalled with the PeakTrace Basecaller™ using a Q average trim of 15 with a window of 20 bases. The trimming has removed the low quality regions from both the 5’- and 3’-ends of the trace. This results in the basecall starting from approximately base 40 of the original KB file and ending at base 991. Figure 2. First 60 bases of a PeakTrace basecalled trace with q average trimming. Figure 3. Last 60 bases of a PeakTrace basecalled trace with q average trimming. Figures 4 & 5 shows the same PeakTrace basecalled trace but with the trimming limited to the 3’-end of the trace. The traces are trimmed to the same base at the 3’-end, but the 5’-end has retained the original low quality region as found in the KB basecalled trace. Figure 4. First 60 base of a PeakTrace basecalled trace with trimming limited to the 3’ end only. Figure 5. Last 60 base of a PeakTrace basecalled trace with trimming limited to the 3’ end only. Using PeakTrace 6 it is now possible to limit trace trimming to the far end of the trace (3’-end) and leave the original low quality initial region intact. This setting can be useful when the the initial low quality basecall can be aligned to known vector and aid in the accurate downstream clipping of vector sequence. This feature is available in versions 6.10 and higher for Auto PeakTrace, Auto PeakTrace RP and the command line PeakTrace. In Part I of this series we looked at how to limit the sharpness of the trace peaks from PeakTrace by using the no peak resolution setting. While this is the simple way to make a PeakTrace basecalled trace look like a KB basecalled trace, the no peak resolution setting does not allow any fine control over the peak sharpness – the final peaks will be as sharp or as broad as they are in the raw data channel. A new optional setting introduced with PeakTrace 6 (extra smoothing) allows the peak sharpness to be user controlled. This option applies an additional smoothing factor (ranging from 1 to 9) starting from the base position selected. While it can be applied to the whole trace, more typically extra smoothing is used to reduce the resolution of peaks in the later regions of the trace (i.e post base 1000). Figures 1 to 3 show an example PeakTrace .ab1 file that has had extra smoothing applied starting at base 800 at smoothing level 3. The peaks are still well resolved at base 840, but at base 1000 and beyond they a far less sharp than is typical for PeakTrace and the trace more closely resembles a KB trace. Figure 1. PeakTrace trace from bases 790 − 840 using extra smoothing. Figure 2. PeakTrace trace from bases 1000 − 1050 using extra smoothing. Figure 3. PeakTrace trace from bases 1260 − 1315 using extra smoothing. Extra smoothing can also be started earlier in the trace with a lower smoothing level to achieve a similar appearance to using the no peak resolution setting. Figures 4 to 7 show PeakTrace basecalling using extra smoothing starting at base 400 at a smoothing level 2. The trace peaks are quite similar is appearance to that obtained using the KB Basecaller. Figure 4. PeakTrace trace from bases 600 to 650 using extra smoothing level 2 starting at base 400. Figure 5. PeakTrace trace from bases 750 to 800 using extra smoothing level 2 starting at base 400. Figure 6. PeakTrace trace from bases 1010 to 1070 using extra smoothing level 2 starting at base 400. Figure 7. PeakTrace trace from bases 1210 to 1265 using extra smoothing level 2 starting at base 400. While extra smoothing is a powerful tool to control the resolution of peaks in a trace, it can be misused resulting is obvious artefacts. The most critical we have seen is the use of an excessively high smoothing value. Figure 8 shows an example of this effect where the extra smoothing was started at base 900 using smoothing level 7. The trace displays a very rapid change from sharp to broad peaks that is not typical of any basecaller. Figure 8. PeakTrace trace from base 885 to 940 using extra smoothing level 7 starting at base 900. The extra smoothing option offered by PeakTrace 6 provides fine user control over the sharpness of peaks in the output . ab1 file. The use of high levels of smoothing (over 3) is not recommended as these can result rapid changes in peak resolution. If this setting is required, we recommend using a low smoothing value (e.g. 2 or 3) starting as late in the trace as possible. A common problem with Sanger DNA sequencing is a rapid falloff in peak signal strength – what is known colloquially as a “ski-slope” trace. This problem can often be difficult to see in the processed data channels because of basecaller normalization, but is very easy to see in the raw channels. Figure 1 shows a typical example of this effect in the raw channels. Figure 1. Rapid falloff of peak signal in the raw trace channel. While there are many causes for rapid falloff in peak signal, the end result is the peaks at the end of the trace are very weak and can be close, or at, the detector noise level. This not only makes it hard to determine the basecall, it also makes it difficult to accurately normalize the peak heights in the raw channel. The PeakTrace Basecaller™ and the KB Basecaller™ have historically had a very different philosophy to normalization of the rapid falloff traces. The KB Basecaller will normalize all the peaks to the same height no matter how extreme the signal declines, while PeakTrace limited the normalization to a factor of 40. On extreme signal decline traces (e.g. where the average peak heights falls from 25,000 to 25) PeakTrace would not “pull up” the weak peaks to the same extent as KB. The reason for this difference is we believe that the user should be aware that the trace had serious issues, and not just have the basecaller “sweep the dirt under rug” and make the bad trace look good. We see many facilities unknowingly produce very poor traces because KB has hidden this problem from them. With the introduction of QualTrace III into PeakTrace 6 it is possible to both fully correct the peak heights while also reporting on production issues like the rapid falloff of trace signal. Figure 2 shows how PeakTrace 5 would normalize and Figure 3 shows the same trace normalized using the PeakTrace 6 Extra Normalization setting. Figure 2. PeakTrace 5 peak normalization. Figure 3. PeakTrace 6 Extra Normalization. The extra normalization setting also improves inter-channel and inter-peak normalization. Figure 4 shows a section of an imbalanced trace normalization by PeakTrace 5. Figure 5 shows the same trace normalized using the PeakTrace 6 extra normalization option. The C and G channels are better normalized using the extra normalization option. Figure 4. PeakTrace 5 peak normalization. Figure 5. PeakTrace 6 extra normalization. The extra normalization setting can also be used with KB basecalled traces to improve their appearance by selecting the ABI/KB basecaller option within PeakTrace 6. Like the clean baseline setting this will not change the base or quality scores, but it will improve the appearance of the trace file. Figure 6 shows a typical KB trace file using standard KB normalization. Figure 7 shows the same trace, but with the extra normalization option used. While not dramatically different, the inter-channel and inter-peak heights are more consistent when using extra normalization. Figure 6. KB trace with standard normalization. Figure 7. KB trace with extra normalization. You might miss production issues that are causing your signal intensity to drop off rapidly. This is one of the most common problems we see with traces that prevent PeakTrace from being able to improve the read length. If you don’t know there is a problem then it is very hard to fix. You may turn detector noise into something that looks like real peaks. This is a problem with KB and a potential problem with PeakTrace if the poor quality regions are not trimmed. Extra normalization is an improved normalization added to PeakTrace 6 that improves the appearance of the PeakTrace basecalled trace file. It is recommend that it is used for all traces unless there is a particular need to use the previous normalization setting. One production problem that can occur with Sanger DNA sequencing is sharp spikes in the raw data channel. These spikes can appear anywhere in the raw channel, are very intense and narrow (2 to 5 scans), with signal in all four channels of approximately equal intensity (Figure 1). These spikes are caused by a small gas bubble in the polymer moving past the sequencer’s CCD detector, causing the laser light to be refracted onto the CCD, leading to a sharp spike in raw signal. Figure 1. Example of a sharp spike caused by a gas bubble. These spikes are often greater than the real peak signal and their presence can lead to problems basecalling the data. Figure 2 shows an example of what one of these sharp spikes can do to the true peak data. The base at the location of the spike can not be determined and the base ends up being called as a N or mixed base (H in this case). Figure 2. Result of a sharp bubble spike on the processed trace and basecall. While these bubble spikes are a production problem that should be solved in the lab, they can be corrected in software using the PeakTrace Basecaller™ (6.12 and higher). Figure 3 shows the same trace file as shown in Figures 1 & 2, but basecalled using PeakTrace 6.12. The spike has been removed with the correct C base peak now clearly visible. Figure 3. Removal of the bubble spike peak by PeakTrace 6.12. While the sharp spikes caused by bubbles can in most cases be corrected in software, it is always best to fix the cause rather than using software to undo the damage. Relying on the basecaller to correct the spikes can result in you missing that you have a production problem. 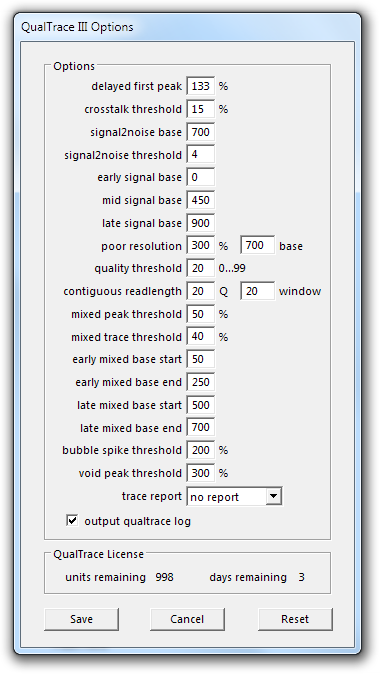 The best way to know if you have a bubble spike problem is to monitor the BUBBLE field of the QualTrace III log file. This field reports the number of strong sharp spikes found in the raw data channel. Significant rates of bubble spikes in production indicate a degassing problem of the polymer and/or buffer and should be corrected. Sharp spikes are caused by production problems, but they can be corrected using the latest version of the PeakTrace Basecaller. It is important to monitor for the presence of “bubble” spikes by using QualTrace III so that production protocols can be corrected if an issue arises. The clean baseline setting within the PeakTrace Basecaller™ is a cosmetic option that can be used to improve the appearance of trace files. While in an ideal world the end user of a DNA sequencing service should not care what the trace data looks like (only the quality and accuracy of the basecall), in practice providing your end users with traces that look “good” is very important. In an industry as competitive as DNA sequencing, every service provider needs every edge they can get and the clean baseline option can provide one such edge. The best way to see what clean baseline can do is to look at some before and after examples. The clean baseline setting can be used with the KB Basecaller by post data collection processing of the KB trace file. This does not change or improve the actual basecalling as PeakTrace does, but it does make the peaks look better. Figure 1 shows a typical example of a typical “noisy” KB trace. In this example the actual basecall is fine, but the trace does not look very nice, since there is a significant amount of secondary signal under every primary peak. Figure 1. Example “noisy” KB basecalled trace. Figure 2 shows the same KB trace after clean baseline processing. The basecall is identical to that shown in Figure 1, but the trace now looks much better. Nothing has changed, except the appearance of the trace. From the end user’s perspective, the trace is better. Figure 2. Example “noisy” KB basecalled trace after applying clean baseline processing. The best way to use the clean baseline option is with the PeakTrace Basecaller. Figure 3 shows a section of an example KB trace file at base 900. The appearance of the peaks is very poor and much of the sequence data of low quality. Figure 3. Example KB basecalled trace file at base 900. Figure 4 shows the same trace file, but after PeakTrace basecalling. While the trace is visibly better than the original KB trace file, it does have an amount of secondary peaks (noise) under the primary peaks. Figure 4. PeakTrace trace file at base 900. Figure 5 shows the same trace file basecalled using PeakTrace, but using the clean baseline option. The basecalls and quality are the same as in Figure 4, but the trace looks cleaner with no secondary noise peaks under the primary peaks. Figure 5. PeakTrace trace file after clean baseline processing at base 900. While the clean baseline option is a very useful tool for improving trace appearance, there are a couple of potential downsides to using it. It can hide from the sequencing facility operator production issues that may be occurring. It is advised that if the clean baseline option is used that the QualTrace III and/or Trace Reports are carefully inspected to identify problems that might be hidden by using clean baseline. Clean baseline is a powerful setting new to Auto PeakTrace 6 that can help improve the appearance of both PeakTrace and KB .ab1 trace files. While not affecting the base or quality score, the improved appearance of the resulting trace files provides facilities with a competitive edge when marketing to end users.